Balance is Beautiful | 2014 Beer Issue | Style Weekly - Richmond, VA local news, arts, and events. Scott Elmquist On the deck of Ardent, workers prep 100 pounds of ginger for the next batch of honey ginger beer. From left: Michael Scovronski, Rob Quicke, Ryan Texter, Austin Harkness, Josh Stoffan and part owner and head brewer Kevin O’Leary. Sunlit and roomy, the Ardent taproom is a pretty chill spot. Hanging above opposite ends of the unassuming bar, two older-model speakers play light and airy modern bluegrass pop. There’s a small sign requesting patrons curb their dogs — yes, dogs are allowed inside the garden area. Outside the taproom sits a large beer-garden patio with strings of outdoor lights stretched above the wooden deck. It feels like this could be a microbrewery in Colorado or along the West Coast, rather than an urban oasis tucked within the industrial district of Scott’s Addition. “We’ve had people in the neighborhood say this is their new back porch to drink beer,” says Kevin O’Leary, head brewer of Ardent Craft Ales, which opened its brewery in the spring. The Zen feel reflects their approach to brewing. A prime example is O’Leary’s honey ginger beer, designed as the perfect summer refreshment. It’s higher in alcohol content (7.8 percent), but the ginger and honey — which they get from Golden Angels apiary in Harrisonburg — are perfectly balanced. Like many famous brew tales, this one started in a garage. 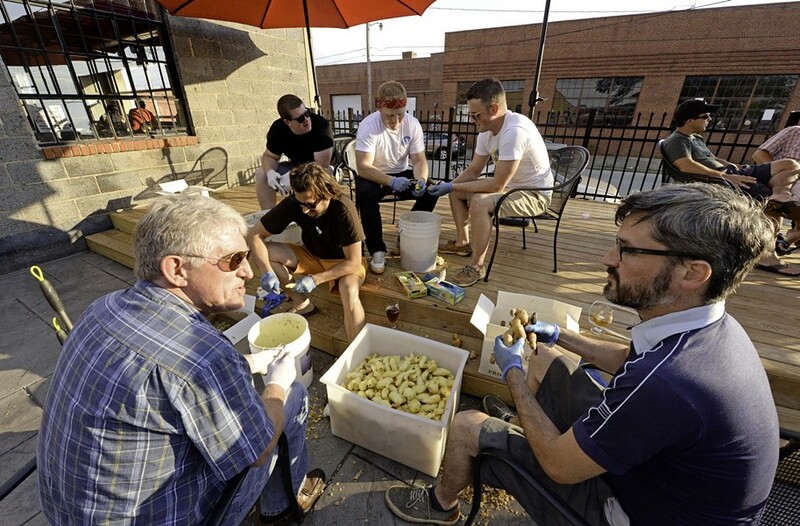 In 2010, on the same block in Church Hill where the Roosevelt soon would open, a collective of like-minded brewers started making beer and inviting people inside to learn about the process firsthand. The co-op got its name from studying the history of brewing. “Ardent spirits” is a term still on the books in Virginia, meaning prohibited, dangerous drinks — the kind that made you burn or glow. O’Leary moved from Cambridge, Mass., where he worked as assistant brewer at a local mainstay, Cambridge Brewing Co. His girlfriend had gotten a job at the Martin Agency and he came with her to check out Richmond, meeting Sullivan at the Commercial Taphouse within his first two weeks. When they started writing their business plan, Hardywood hadn’t launched. When it did, its success helped strengthen their pitch to investors. Other local breweries provided helpful construction tips — the beer community here is competitive but friendly. A small-plate, meat-and-cheese menu continues to be refined. But Ardent also allows you to bring food in. “We want to be a place where people can sail in, chill out, and even when it’s bustling, nobody is stressed out,” Sullivan says. With 10 employees and about 30 draft accounts across town, Sullivan says Ardent is working to stabilize production and build on its quality, streamlining along the way. The Ardent building, which used to hold a shipping business, holds four fermenters and a 15-barrel brew house that requires two brews to fill one fermenter up. That starts a two- to three-week fermentation process. Sullivan estimates making 1,400 to 1,500 barrels a year initially. Wednesday-Thursday 4-9 p.m., Friday 4-10 p.m., Saturday noon- 10 p.m., Sunday noon-6 p.m.